Firstly: apologies for the long gap between posts - I don't know what I've been doing, but I promise you that I've been extremely busy doing it!! We were delighted to receive news that we have been successful in our grant application to Lottery's West. After some deliberation we have awarded the contract for Trails Consultant that Lotterys stipulate we use the funds for, to Colin Ingram. 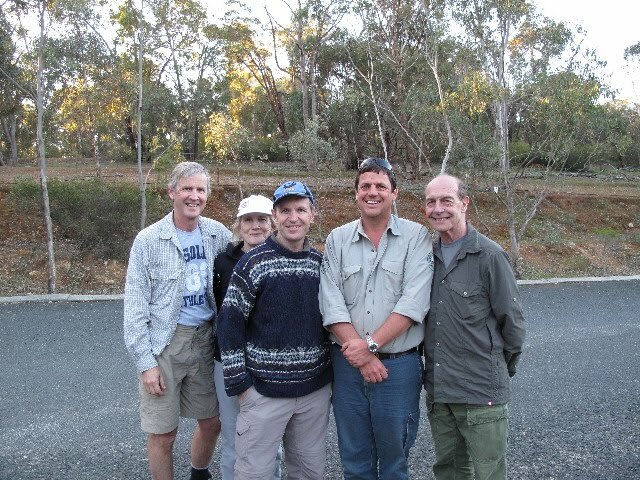 Having Colin on board is a real coup for us as he has a mammoth amount of experience in Trails and Tourism here in WA: and it's been a real pleasure going through the details of the Pilgrims Trail with him and seeing his excitement for the project. We have really stepped up to the next level. Maggie and I are preparing to walk the whole route with the up coming Camino Salvado in 10 days, and I have to say that the joy and delight of been out on the Trail again is just as good as the first time: this will be a jewel in the Crown for WA for decades/centuries to come. 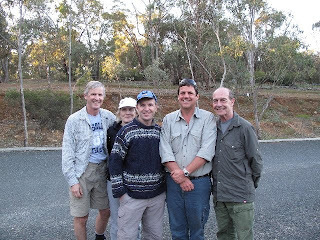 The photo above shows the two of us with current Board member Ean James on the right: next to him is Paul Udinga -an amazing guy and the Ranger at Walyunga: and next to him is Colin Ingram our very own Trails Consultant doing "due diligence". Keep the emails coming: I really appreciate them. And remember that the Trail isn't "open" as such, as there is still much to do with regard to signage and educational material etc. But there are many sections that you can walk and savor. Enjoy!